Coop Housing Societies and Apartment Condominiums in Maharashtra can now apply online for deemed conveyance. Please make use of this facility to ensure that the land records are updated with your legal CHS, Apt name. Q1. What is a Property Card? Ans: A property card provides information about the ownership of a property and history of holdings of a land located in urban area. If you are planning to buy a land in urban area, it is essential that you check the property card of the seller and ensure his/her ownership of the land. Even if you are planning to buy a flat, you may want to check the ownership of the land on which the apartment is being constructed. This will help you avoid any hassle in future. Most of the developers, local governing bodies and investors seek property card of the owner before closing a deal. This document is also used in court litigations related to land within city limits. Q2. Details included in Property Card? Details of pending litigations, if any. Details of tax levied on the land. This includes paid and unpaid taxes. Q3. What are the uses of Property Card? Evidence of the land ownership. In urban area, this card is used to check the ownership of a particular property. Details of past transactions and disputes (if any) . Q4. How to obtain Property Card? Ans. Property owners are required to approach the City Survey office to get the property card for their properties. However, in recent times the government has made it possible to get property cards with a single click of the mouse. Property cards for all land properties are available online. This enables property owners to avoid the time consuming process of applying through city survey office. Q5. What is the difference between the 7/12 extract and property card? Ans: In Maharashtra State Property Card is for Urban Area and 7/12 utara for land in rural area. Both are title cards city survey for residential property and 7/12 for agricultural lands. The 7/12 extract is a record of a land property in a rural area, ownership of the property and type and purpose of the land. This mainly deals with areas that are outside city limits. Property cards contain information about a specific property in urban area and its ownership. Making land records available online will help reduce fraudulent activities, settle ownership or other land related disputes and maintain an updated public record. 7/12 extracts for the entire state of Maharashtra were made available online in 2006. Computerizing property cards and making it available online for all the districts in Maharashtra is still in progress and is estimated to cost around Rs. 25 crores. This project includes computerizing all 7/12 extracts and property cards in 358 taluks of 35 districts and training government officials on hardware, software, data entry, verification and validation of records. This project is expected to be completed in 2015 and will enable you to obtain land related records and update land related documents from the comfort of your desk. Though this is a welcome move by the government that enables transparency and reduces time wasted on official processes, implementing the project across the state, mainly in rural areas, and training users and employees on the system will be a huge challenge. Q8. What is City Survey & Property Registration Card? Ans. The City Survey of Mumbai Suburban District has been carried out during the period 1963-67. The City Survey Record is prepared for all the villages in Mumbai suburban District. The City Survey Record for each individual parcel of land has been created and given in particular number. A property card for each City Survey Number is also prepared. Q9. What does Property Registration Card contains? The names of the Holders are only incorporated if the property is non-agricultural. If the property is agricultural, only tenure is mentioned as agricultural in P.R.C. When the property is converted in N.A. the holder name can be incorporated in the P.R. Card after producing necessary documents by the Applicant . Q10. 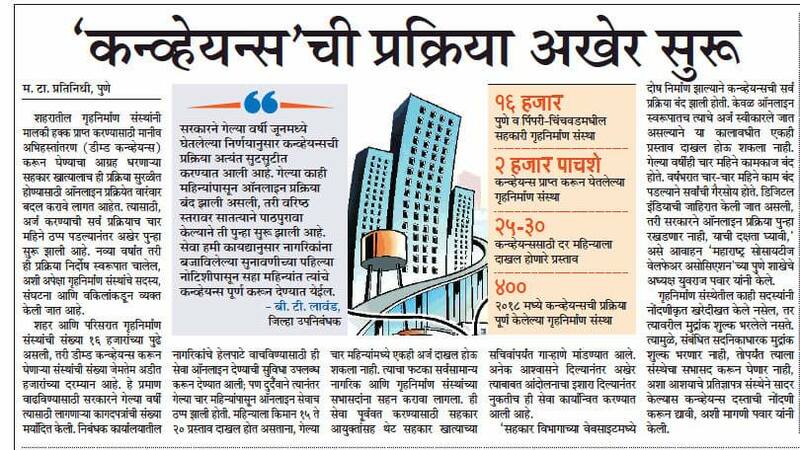 How many City Survey Offices In Mumbai Suburban from where property card can be obtained? Ans: In Mumbai Suburban District there are three Talukas viz Kurla, Andheri and Borivali, consisting of total 86 villages. City Survey of these 86 villages were done by 10 City Survey Offices. Q11. What is the Jurisdiction of each city survey office where property card can be obtained? Along with the above CTSO’s there is an independent Office of the Taluka Inspector of Land Records, Mumbai Suburban District. The Superintendent of Land Records is the controlling authority of all the CTSO’s and the Taluka Inspector of Land Records. Survey fees :– (1) The survey fees payable under Section 127 shall ordinarily be so fixed by the Collector that the total sum payable in respect of the site under survey shall cover the cost of the survey and preparation of the Property Card thereof. (2) In fixing the fees for each building site or any portion thereof held separately, the Collector shall have regard to the provision of sub-rule (1) and to the position, value and area of such building site or portion thereof.